David Rackley exited Friday's assignment in St. Louis for an unspecified reason prior to the 8th inning. 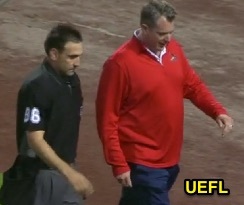 Rackley, who had been spotted speaking with the Cardinals training staff an inning earlier, departed the Phillies-Cards game prior to the top of the 8th inning, resulting in a delay as 2B Umpire Hunter Wendelstedt retreated to the umpires' room to change into his plate gear. Wendelstedt at home plate was assisted by 1B Umpire and Crew Chief Larry Vanover and 3B Umpire Ramon De Jesus for the remainder of the regulation contest; the delay prompted by Rackley's departure for undisclosed reasons was the latest in a game that had already experienced over an hour's worth of weather-related setbacks. Related Post: Injury - David Rackley Leaves Twins-Nats Game (3/6/17) [Most Recent Injury].